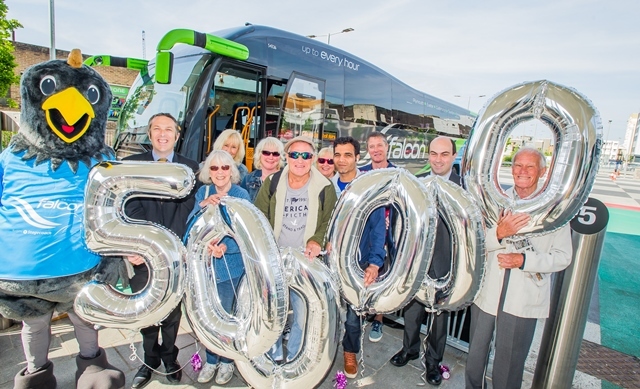 Stagecoach South West Falcon is celebrating carrying over half a million passengers, a fantastic achievement for a service that only sprang into being just over two years ago. Passengers waiting for the 10:00 departure on 17th May were met by the Stagecoach team who were handing out millionaire’s shortbread, free tickets and Falcon goodies. Mascot Pat the Falcon was also there to pose for photos. Bob Dennison, Managing Director of Stagecoach South West, commented: “I’m over the moon that we’ve won such a highly regarded industry award. It is testament to all the outstanding work undertaken by our team in keeping the Falcon flying 24/7 across the South West. The South West Falcon has made a donation to Taunton’s not-for-profit Peregrine Project. This will support the live streaming of a nesting pair of falcons who have taken up residence in the tower of St. Magdalene Church. Launched on 14 February 2016 at a cost of £2.5m, the South West Falcon is the first dedicated 24/7 coach service to connect major locations across the South West. To help improve reliability over the busy summer period, a new timetable will come into effect from 21 May. Coaches will run at least every hour during the daytime and up to every 30 minutes at the busiest times over the weekend. Customers can view the South West Falcon timetable and plan their journey by Falcon at www.swfalcon.com or by downloading the new Stagecoach Bus app from App and Play stores. The Stagecoach team who were handing out millionaire’s shortbread, free tickets and Falcon goodies. Mascot Pat the Falcon was also there to pose for photos.